Recoil Pad, 12 Ga., Vented (For Models w/ a Wood Stock) | Gun Parts Corp. 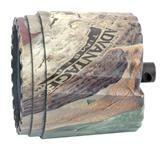 Factory vented recoil pad with Benelli logo. Fits models with a wood stock.